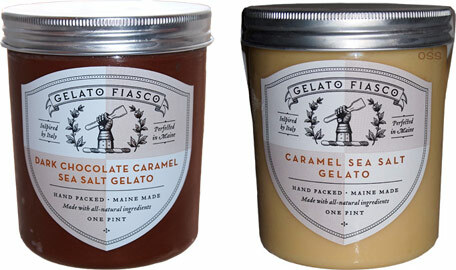 Alright, time to try the last two free samples from Gelato Fiasco. Both are sea salt caramel, but one adds cocoa to the mix. Should be interesting as this young company doesn't mess around. Whoa, color me impressed! Talk about a unique flavor. First word that pops in to my brain? Coffee actually! When such a straight forward cocoa is mixed with a "burnt" caramel, you can't help but think coffee. It's just wonderfully complex, so much so that I will overlook my disdain for coffee because I need more of this in my belly stat! Scoop... scoop... scoop... hmmm, I find this one so intriguing. It's funny how the cocoa accentuates that "burnt" aspect of the caramel. I keep saying "burnt" because I'm not even sure if that's the right word. It's when the caramel has that startchy(?) complexity where the taste and texture start to become one. You sit there going "do I want to say the flavor is gritty, or the texture?". Not that the gelato is gritty, it's quite nice. 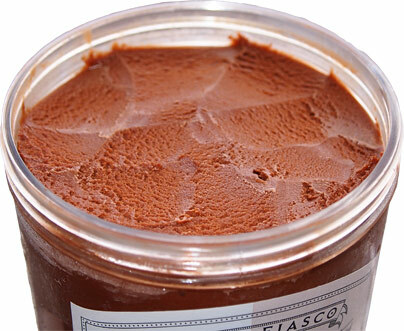 My brain is kind of messing with me because I'm going "is this a sauce or this a gelato?". On Second Scoop: yeah, this one is a complex one, I do think it's wearing me down a bit since I've never been able to get in to coffee flavors. That doesn't mean I can't respect the excellent quality here. Another unique flavor that begs to be tried! 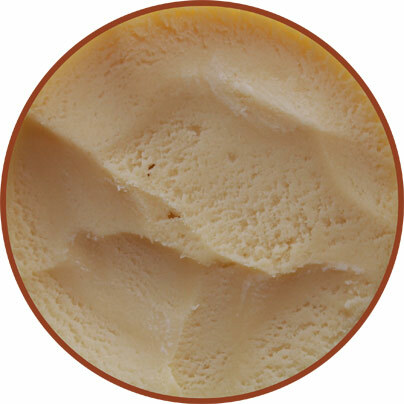 Here is the non-chocolate Caramel Sea Salt Gelato opened up. Well apparently I should have had this one first because it totally would have explained that which I couldn't put my finger on in the dark chocolate version. Simply put, this one is really salty. Like, so salty I can't eat it plain. I feel bad saying that of a quality product, but it's way too much for me on it's own. That said, please remember that I tend to have trouble with really salty products (as is evident by commentors going "ahh, dubba, it's not that bad"). So take my comments as you will. That is all. On Second Scoop: I've tried scooping this a few more times and I can't get past the first bite. I asked my wife to try it and she made the bleck face like my daughter does sometimes. Ok, apparently it is that salty. It's weird because it says it's only 2% of your daily sodium allowance, but it feels like 200%. These guys are based in Maine and slowly moving south. The quality is excellent so I expect ever expanding distribution from these guys. I can now find them at my local Whole Foods, but it could be a while before they hit the midwest. Just picked up a pint of the Chocolate version here in Vermont at Healthy Living. I didn't read the review first but I don't regret it. I liked the Dark Chocolate Caramel Sea Salt Gelato. I agree that you get a burnt caramel after a few bites, but I really enjoyed that. It didn't come off as coffee to me, but I might not have enough coffee-tasting experience to know. Just spotted this brand at my local star and had to try it. I agree that the regular caramel sea salt is salty but I love it. In my opinion most caramel sea salt products are not salty enough. My store only had three flavors of this brand but I will be looking for more! OMG. These are the two flavors of ice cream which I could live off of for the rest of my life if I had to swear off all ice cream with the exception of two flavors. Your review here just goes to show that I can't always trust your opinion ;-) ha. Both of these are so good I'd have a tough time picking just one to eat forever, as it depends on if I'm in the mood for chocolate or not. YUM!!! It's not about trusting my opinions directly, it's about figuring out how they apply to your unique tastes. We are all different and I am glad you enjoyed these. I loved both versions. I also am a huge fan of salty icecream. I do very much prefer the dark chocolate version. Heaven.